Times were certainly different back in the days of World War I. Stealth bombers, mobile communications, terrorists and satellite navigation systems were all a long way off yet. The battles were in the trenches – and they were brutal. Harry Patch, Britain’s last survivor of the trenches of World War I, was a reluctant soldier who became a powerful eyewitness to the horror of war, and a symbol of a lost generation. via Last British WW1 veteran dies – World – NZ Herald News. 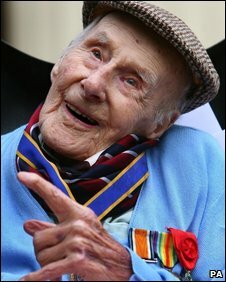 Henry Allingham, the world’s oldest man and one of the last surviving World War I servicemen, has died at the age of 113, his care home has said. Mr Allingham served with the Royal Naval Air Service in WWI, later transferring to the Royal Air Force at the time of its creation.